On Stage: Past, Present REVIEW: 'Guess Who's Coming to Dinner' at Arena Stage revisits 1960s race relations. In the early 1960s I was editor of the Ft. Belvoir, Va. post newspaper when I met a young career Army sergeant who had recently returned from the Far East with his new Asian bride. He was living in Virginia, one of 17 states that made interracial marriages illegal, and was concerned about what could happen to them living under such a racist law. Such laws don’t exist anymore, but the 1960s were a turbulent period of national unrest and a growing civil rights movement challenging the white liberal establishment and threatening the politically entrenched conservatives who supported the status quo of non-integrated schools and public accommodations. A change was coming, but it wouldn’t come peacefully. And where it was not violent, it festered silently in the boardrooms and in other hidden entrenchments of racism in white households and at every socioeconomic level. It was in that atmosphere that a provocative film about interracial marriage, “Guess Who’s Coming to Dinner,” became the hit of 1967, with a cast of superstars that included Katherine Hepburn, Spencer Tracy and Sidney Poitier. It went on to be nominated for 10 Academy Awards, with Hepburn picking up best actress and the screenwriter William Rose, best writer. A theatrical version of that film written by Todd Kreidler, based on the Rose screenplay, is now playing at Arena Stage. And while the topic is still of interest, there is a stilted, time warp feeling about the Arena production. Everything is a bit too neat: the pretty, young blonde girl who grew up in a privileged San Francisco environment is in love with a super successful black doctor who is into humanitarian medicine and has a host of degrees and accomplishments; her liberal, pro-integration parents — her father runs a San Francisco newspaper and her mother owns a tony art gallery; they have a sassy black maid; and the doctor’s parents are conservative black middle class. But you get the idea. Interracial marriage was always the hot button in racial relations. Emmitt Till was murdered in the south just for whistling at a white woman. That is why “Guess Who’s Coming to Dinner” was considered daring and became a box-office sensation. In the play as in the movie, Joanna Drayton (Bethany Ann Lind), a child of privilege who has discovered she is in love, has returned unannounced from Hawaii with handsome, too-good-to-be-true Dr. John Prentice, (Malcolm-Jamal Warner). Because she has such liberal, unbiased parents she naively believes her parents will be happy with her surprise announcement that she and Dr. Prentice, 14 years her senior, are going to be married. Lind deftly handles the key role of a stubborn young woman who is strong enough to defy her parents if necessary. She is the most believable person in the cast. Warner is a strong presence in a role that doesn’t have much dimension. Playing in the round on Arena’s Fichhandler Stage, “Guess Who’s Coming to Dinner” has an excessive running time of two and a half hours. Under David Esbjornson’s direction, the characters, especially Joanna’s father, Matt Drayton, portrayed by Tom Key, is called on to express much red-in-the-face anger as he confronts a situation he has approved of in print, but not in his house and with his daughter. He works a bit too hard being angry; at times, it just seems bombastic. Tess Malis Kincaid is poignant to watch as Joanna’s mother. A range of controlled emotions painfully sweeps across her as she attempts to find a way to accept the situation and handle her out-of-control husband whose fulminations are destined to destroy his relationship with his only child. A back-story about a son who died several years earlier doesn’t seem to add much to the play. There is a similar back-story, almost indifferently tossed in, about the wife and son of Dr. Prentice being killed in an accident. Lynda Gravatt provides some comic relief as Matilda Binks, the maid who has been with the family for so long that she can get away with her sarcastic asides, as does Michael Russotto, the scotch-loving Monsignor Ryan with a cultivated Irish brogue. The battle for treating all people with fairness and dignity will probably never be won, but since the Civil Rights movement, most of the official legal obstructions have disappeared. While interracial marriages are more common now, someone could write another “Guess Who’s Coming to Dinner,” but this time it could be about gay marriage. 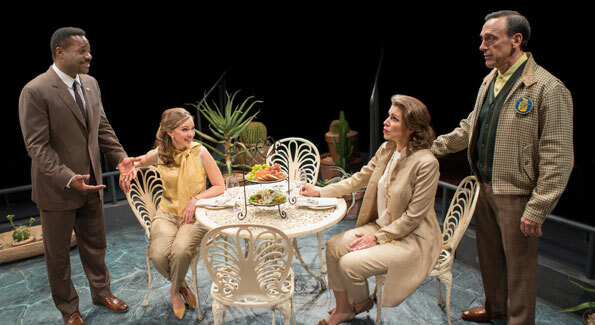 “Guess Who’s Coming to Dinner” continues through Jan. 5, 2014 at Arena Stage at the Mead Center for American Theater’s Fichandler Stage, 1101 Sixth St. SW, $75-$90, available 202-488-3300 and online here.